timetotrade's FREE STOCK and FOREX CHARTS >> are fully customisable. You can change the chart settings to suit your investing preferences. You can change the default chart settings and technical indicators to suit you, so whenever you login to your timetotrade account, the charts will automatically default to display your personal settings. This will take you to the chart settings display. Add any number of overlays or secondary indicators to the charts. Select from a library of over 170+ pre-programmed indicators or create your own indicators. 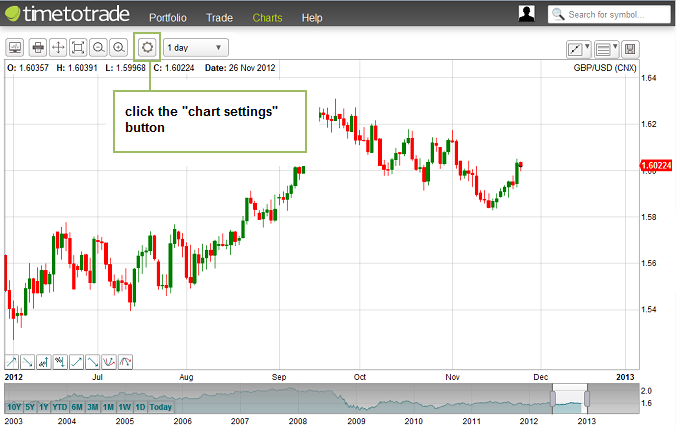 Click the "Save Settings" button to save your selected indicators and parameters as your default chart display. Adjust the view and interval period from the drop down menus to your preferred settings, and click the "Save Settings" button to set these as your default settings. The chart and interval period will now default to your selected view and interval period. The next time you login into your timetotrade account and whenever you open a new chart, the chart will automatically default to your preferred display. 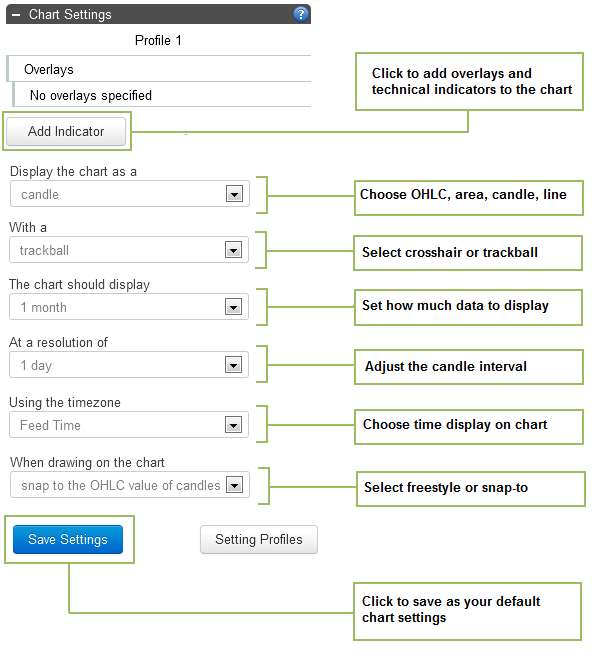 You can also customise your chart settings to default to line or candle charts and choose which technical indicators and overlays to be displayed on your charts. In addition you can create multiple chart profiles, with each profile containing different chart settings at varying intervals and related views.